What is a modern balcony? 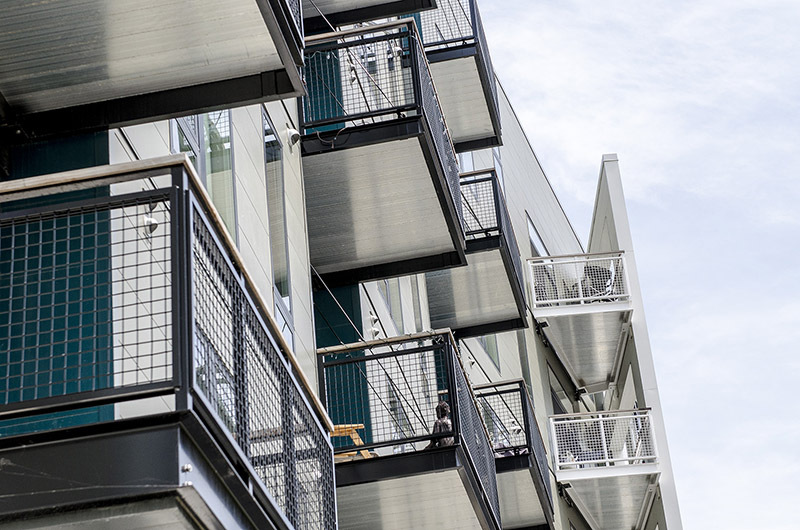 Modern balconies in multifamily construction are hot right now. Residents want balconies for connection outside of their living space…to feel breathtaking views, take in the sounds of nature, or view the bustling city from above. Subsequently, balconies are now a necessary design feature. This increased balcony demand creates a need for a modern way of thinking about balconies. What Makes a Modern Balcony? Historically, balconies were made with cantilevered wood and steel, which need frequent upkeep and become unsightly and unsafe over time. The current building industry trend uses aluminum for balconies, and adds prefabrication to meet construction demands. Aluminum prefabricated balconies represent the modern era by making installation easier, occupants safer, and they are almost maintenance free. This article in gb&d magazine talks more about why modern balconies meet modern construction demands. One of the great elements of a modern aluminum balcony is that they’re really ready to hang; you have the entire component, it’s powder coated, ready to bolt on the building. Some of the differences of a ready-to-hang modern aluminum balcony are superior safety, limited upkeep, and design appeal. And for an owner it’s great to have that control over the schedule; there’s a real benefit versus the past piecemeal solution. Howard Wurgler, owner of Midwest Stairs & Iron and early adopter of prefab aluminum balconies, says, “the design of our balcony is very strong. We don’t use the thinnest possible materials. I would rather use heavier materials and a better structure because I have people who are going to be on these balconies, and I have to make sure if there is a child, or 10 adults on there, people can be on the balcony without fail; it’s a very well built system, it’s all welded.” All of the aluminum balconies at Midwest Stairs & Iron are custom designed, based on the unique needs and specifications of the project. Aluminum balconies have evolved into something that offers many different options. For instance, the North End project in Milwaukee, WI has multiple buildings, and each building has a different balcony design. Some of the aluminum balconies have glass, some cable rails, some mesh panels, and some colored glass. The architect wanted to make a unique urban look where the design variations worked together to create a cohesive expression. Altogether consumers will continue to seek out the newest and best of everything. As long as developers continue to push the limits of design and function Midwest Stairs & Iron will continue to answer the call. To ensure the client’s vision is maintained throughout the process, Midwest Stairs & Iron collaborates with architects on design. Give Midwest Stairs & Iron a call to get the latest insights on modern balconies. If you would like to have a preliminary design discussion start here.